So, you want to guide in Alaska? *First off, all rental shop guides and specialists are encouraged to use our kayaks and paddleboards, free of charge, to explore the Juneau wilderness on their own time! Develop comprehensive knowledge of rental shop kayak and SUP fleet, and Juneau paddle areas. Provide superior customer service, teach basic kayaking/SUP skills, Facilitate safety briefing to rental guests, transport guests and kayaks to various launch points around Juneau. Develop proficiency in retail and rental POS system, handle credit card transactions, maintain rental and retail inventory, answer phones. Learn Kayak and SUP repair techniques and assist with maintaining rental fleet. Actively maintain safe and clean customer areas, workspaces, bathrooms, and kitchen areas at all ABAK locations. Maintain and safely operate company vehicles. Support glacier and kayak tour operations by preparing snacks, maintaining gear, and assisting guides. 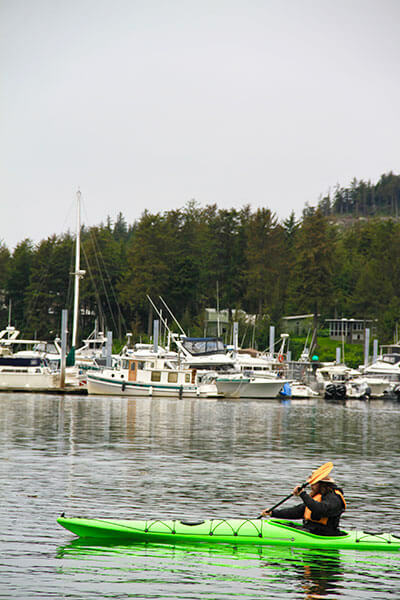 Assist in development and facilitation of half-day guided kayak and SUP tours in Auke Bay Harbor. Train Rental Specialists in kayak shop operations, paddling skills, and guiding protocol. You're gonna love this place. Submit Application and Resume here! Send us a quick message with any and all questions. We'll do our best to reply within 24 working hours.